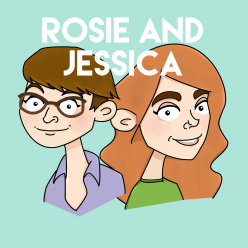 In episode 46, Rosie and Jessica record via the medium of The Internet, so the sound quality is a little “rough and ready”. There’s been a veritable glut of exhibition-going, a fairly acerbic theatre review and rapturous reaction to a birthday tea. Plus a post-credit sequence that made our dad think Rosie was crying. Jessica picked pastel wonderland All About That Bass by Meghan Trainor, while Rosie identified Jordan Klassen’s Balcony on the Vinyl Cafe from CBC. Please do have tea at The Langham. Rosie has finished her Camp Out Fingerless Mittens which you can view on Twitter, while Jessica has made (and remembered the name of) Peekaboo Mitts. Friend of the Show, Louise, has been reviewing some Christmas television movies at A Seasonal Movie for Christmas. Get toned in the presence of a legend of stage and screen with Angela Lansbury’s exercise video. It’s not deja vu, here’s a cover of Jessica’s song, All About That (Upright) Bass.